Millions of leg amputations on diabetic patients are enough! Such a huge number of amputations have been carried out during the last decades. Most of them unnecessarily, as the author of this book is convinced. Because already in 1977 - when asked for advice in a dramatic case - he found a way to save the leg of a diabetic patient that urgently should have been amputated because of diabetic gangrene. After that, surprisingly, the Diabetes itself healed up. 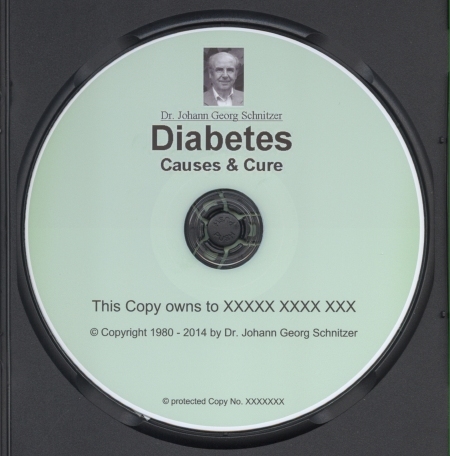 Dr. Schnitzer discovered the main cause of incurability of Diabetes. to protect yourself from serious later consequences. Would the knowledge in this book be helpful to you? If yes, please click the Book order site. If not yet sure, please continue to read. It's the common diabetic diet itself! Its high content of protein makes the disease incurable, and the protein oversupply causes the so called "later consequences" or "later sequelae" of both types of Diabetes (type I and II): Gangrene, hypertension, nerve degeneration, loss of sensation, impotency, loss of eyesight, liver degeneration, inner bleed to death because of varicosis of the esophagus, and renal atrophy. Therefore, this whole complex of nightmares becomes prevented, and in most cases also cured, by the "civilized origin nutrition" described in this book. Why, till now, this knowledge isn't used regularly to help and cure the diabetic patients? 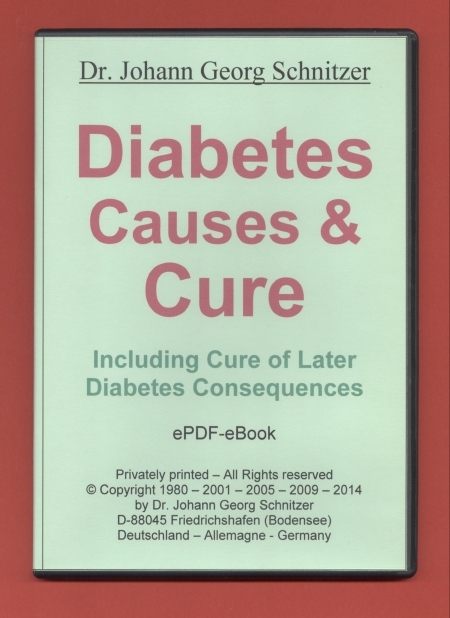 Isn't it a failure to render aid, or even a refusal of aid, when diabetics aren't informed by their physician about this natural, highly effective preventing and curing therapy, that could cure their Diabetes and their "later consequences" they are suffering from? It can't be an insufficient publication of this curing therapy. Because already in 1981, on the "Medical Week of Baden-Baden", several cured former diabetics, within them children who had Diabetes type I before, were introduced to the audience (physicians). The audience could interview the patients and the treating physician in all details. The first edition of this book was published already in 1980. It reached 10 unchanged German editions, with a total of 73,000 sold copies, until it went out of print in spring 2000. Where did they go, these 73,000 copies? Sure, estimated at least 10 % of the readers must have been (= 7,300) physicians, rather more. These physicians, having read the book, and being trained in scientific thinking and medical ethics - shouldn't they have been eager to try and recommend this completely natural, biological method to their patients, and eager to support them when reconquering their natural health? Was it the medical doctrine, maintained by so called "medical popes", saying Diabetes to be incurable, why they even didn't try it? Or was it the fear, to have it one's own way, in this field of Diabetes, that is especially strictly ruled by doctrines, "medical schools" and economic interests? Or sorrows, to be branded as an "outsider", when starting to cure the diabetic patients, instead of submissively only treating them and again and again correct (elevate) the dosage of tablets or Insulin? It's true, this orthodox "treatment" at last gets out of control, but in case of legal consequences, the physician is protected by the "opinion of a medical expert", who is named to the court by the "ruling school". The beginning of the 3rd millenium is an opportunity for the critical examination of the past and present course of the "modern medicine". Why is it in crisis, and what should be its new goals? Main fields of this crisis are pointed out - ethics and morals, tremendous costs exacted by the medicine, and their reliability. Why aren't physicians healthier than the population, for example? For more, please click here! In fact, the truth about the curability of Diabetes and its later consequences touches considerable economic interests. In Germany alone, the turnover with pills, injections and other materials for diabetics exceeds 50 million US$ - not per year, not per month, but per day! Who acquires the knowledge transferred by this book, too will be better able to find a physician who not only wants to treat for lifetime, but to cure his patients for good. Why is a physician needed? Mainly, to correct (lower) the dosage of the Sulfonyl urea tablets or the Insulin, according to the lowering blood sugar level when starting the new healthy nutrition. Many diabetics have learned to do this by their own. Would the knowledge in this book be helpful to you? If yes, please click here: Book order site. If not yet sure, please continue to read. Several of these cases are described in details in this ebook "Diabetes Causes & Cure". Who suffers from Diabetes, or who has diabetic family members or friends, shouldn't miss to read this revelation about the real causes, the chances of cure, and the secure prevention of Diabetes and its later consequences. This ebook teaches even more than how to cure Diabetes. It explains the natural basics of health, the prevention and the cure of chronic conditions in general - with the diabetic disease as an example. Read the numerous case reports of the few physicians who applied this knowledge to cure their patients! The common symptomatic substitution treatment of Diabetes is based on the (wrong) presumption, that Diabetes would be incurable. Therefore, the treatment is limited to whipping on the B-cells to produce Insulin by a growing dosage of Sulfonyl urea, until the B-cells become exhausted. After that, the Insulin substitution follows, also needing from time to time an elevation of the dosages, until at last the matter gets out of control. In cases of Diabetes type I, immediately Insulin is injected. At the same time, carbohydrates are reduced in the nutrition, because the diabetic patient has only a reduced ability to process them. This biological method, however, aims at a cure of the disease by removing the true causes of the insufficient Insulin efficacy, and by re-establishing the natural basics of health, mainly by a man-appropriate natural nutrition. This normalizes the metabolic processes, and re-enables the patient to metabolize carbohydrates without the former limitations.